THREE times a week, the sound of children fills the downtown community centre of the Eritrean community. Tutors work with children of refugee families, many of them who spent years in camps in Africa without formal schooling. The program is one of several run by the Eritrean Community In Winnipeg Inc., which helps newcomers adjust to Canadian culture, language and life in Winnipeg. 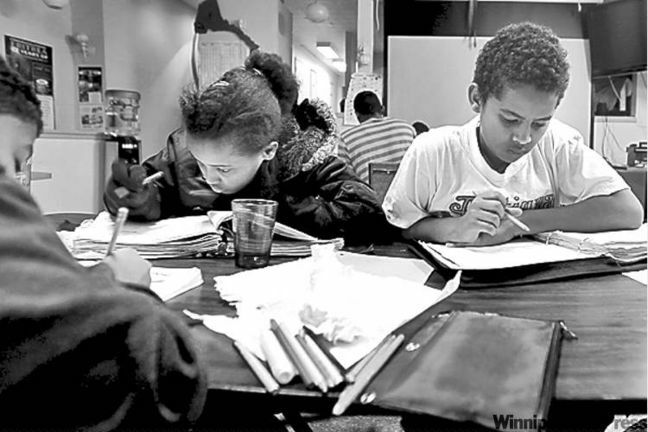 Immigrant communities often run similar programs, but the adoption of these programs was the direct result of a horrific and bloody tragedy — the shooting death in August 2007 of 14-year-old Sirak “Shaggy” Okbazion, who had moved to Winnipeg with his family four years before. “Everything we have done was a direct response to Sirak’s death and how he came to die,” Lambros Kyriakakos, president of the Eritrean centre, said. The Okbazion family came to Winnipeg in 2000, sponsored by the First Mennonite Church. They were refugees from war-ravaged Eritrea, looking for a fresh start after years in a Kenyan refugee camp. Rezene Okbazion, then 34, his wife, Hiriti, 30, and their two young children, Sirak, 10, and his sister, Segen, 4, lived in a small apartment off Logan Avenue. Shaggy’s life ended in the dark, early hours of Aug. 27, 2007 on Sherbrook Street — and his family fell into a nightmare. Police found his body beside a garbage bin on Sherbrook Street. He’d been shot and bled to death. Shaggy had fallen in with a group of teenage boys who were members of the Mad Cowz, a street gang fighting to control the drug trade in the downtown and West End. Shaggy wasn’t a formal member of the Mad Cowz, but he hung out with them. Kyriakakos said Shaggy’s death shook the Eritrean and African communities to their core. Kyriakakos said while western media are preoccupied with the wars that have ravaged many African countries, life in most African communities has a strong communal, social but conservative attitude, where all adults look out for the interests of everyone’s children. When they arrive in Winnipeg, they find their non-African neighbours don’t want to know them and care little for their children. The Eritrean group devised several programs to bridge this culture gap for both the parents and families, including English-language classes, driving lessons, support for single mothers and government and non-government resources. HELLO! HELLO!….. CAN YOU HEAR ME. This is a very good news, a shining example to many other immigrant communities. The Eritrean diaspora communities need to learn one or two of this project born out of a deep sorrow and a tragedy. This is a unique inspiring successful project that will leave a long term legacy. ato Lambros Kyriakakos, I have read some news related to Eritrean “politics” about you and Winnipeg in the media recently, it was not good. Politics should not be allowed to take the shine of your good work and your dedication to the Eritrean community, and the good Eritrean values and culture. I do not live in Winnipeg and I do not know much. My only concern about many Eritrean communities, such as yours, is that a healthy and good Eritrean nationalism is intertwined with Higdef’s party politics. This mix is divisive and may be destructive at times, therefore, the Community may need to stay neutral on its political side while keeping the healthy and good part of the Eritrean nationalism. assenna, well done for posting. afcaristo para poli Lambros and the eritrean communty in winninpeg. We have recently seen the ugliness of Eritrean politics in the city of Winnipeg, Canada. It was one of the lowest moments of diaspora Eritreans. Why people go that far to destroy something that they share so much in common is so mind boggling to say the least. I have come to realize that no matter what his political belief is, Mr. Lambros Kyriakakos is a very decent man who seems to deeply care and work hard to help Eritreans in Winnipeg. I don’t care how much people hate the PFDJ, after all it is one of the few totalitarian regimes that are left, but it pains me to see people losing their vision and do everything they can to destroy their children’s self-esteem by destroying the image of their communities. We live within a society that is highly competitive and cares little about the weak. Strong communities strive well and the kids that grow within them grow up to be high achievers. Strong communities are well respected and they usually have strong voices in the political system they live in. Now think of the diaspora Eritrean communities in every city that you live in: they are divided, they are weak, and they are invisible. You be the judge about the type of kids and the youth they produce. That is the sad part and it is totally not part of our Eritreanism. If you destroy a community, you destroy one of the vital organs of your body part. I don’t know how many good thins have been done by Mr. Lambros Kyriakakos to eritrean people. if he did like what you are advocating now, i would like to thank him and encourage him to proceed with his benefactors. surprisingly, Mr. Lambros Kyriakakos heard from his tongue that he hates and underestimates the youngsters who came to the diaspora fleeing Eritrea crossing illicitly the boarder of Eritrea. an individual is obliged to flee his beloved family and country because he could not live in his own country economically and safely. Mr. Lambros Kyriakakos supports HGDEF who is now worldwide famous monarchy and dictatorial system. Mr. Lambros Kyriakakos is totally against the eritrean movement who is against the dictator. even though it is his absolute right to support any entity, as an individual who is appreciated because of his good contributions to our people, he should stand neutral and for Justis in Eritrea. because what he is doing now contradiction to the Eritrean people especially for the Justice seekers. A COMMUINTY CENTRE BORN OF TRAGEDY. lambros sirak or nickname is shaggy he is not from a village of melitil in sparta or from vassilis spyrous. don’t try to play a game .the picture was old picture. you have done mistake and now try to coverup it was too late.the death of sirak real the mistaken of eritrean community of winnipeg. the eritrean community in winnipeg only the care about money not about the family. What a despicable trashy comment is this! You have to be low life to write this. What an idiot! If a person like you wrote this garbage in the name of “defending Eritrea” and its values, then I will renounce my Eritrean citizenship. I feel shame to be counted with you. ato Lambros is more and better Eritrean than you and your likes. I do not have a problem with his good work and his excellent work ethic within the Eritrean community. My problem with ato Lambros is only his Hgdef politics mixed in the community. I want to see a politically independent community. Period! cambo and lambros both of you are trashy.i know you who you are. ….Kyriakakos`s crocodile tears are dripping on my computer ,here in California . Mehaberecomat is there for higdef propoganda, Do theyy like the new arriving refuge youth ? no according the Isayas stooges they are traitors who abandoned their country. We are going to expose these pretenders. The first fight should start against the pretender mahberocomat all over north America. Tooth less opposition at least start by challenging mahberecomat stop your endless Akebatat action is needed . I am always saddened by the death of Sirak, mainly being from Winnipeg and attending his funeral service at the Mennonite Church. However, this report is not an honest one because Mr. Lambros is trying to use the tragic death of Sirak for his political gains by trying to twist the arms of the Winnipeg Free Press to side with his community. To give a brief background to support my argument, recently, Mr. Lambros and the community he represents have been scrutinized for collecting 2% tax forcibly and intimidating the Eritrean refugees in the city. This was reported on the same paper. After that he organized a rally in front of the office of the Winnipeg Free Press to deny the reports. However, the paper was not willing to be pressured by him in to changing the story. So now he is reverting his strategy by shedding crocodile tears on the death of the innocent Sirak. What a shame, and for his Father to be used this way, it must be more painful. After all is said and done, such reports or crying is not going to change the freedom of the press in Winnipeg, we will keep opposing their hideous agenda of intimidating and controlling the Eritrean people. I think the Winnipeg Free Press and its employee are much more smarter than these senseless blind HIGDEF supporters. The dye has been roles…there is no return….such cheap and disgusting reports are not going to slow our fight against the dictatorial regime back home and outside. How can demo.assenna.com buying this cheap propaganda?